FILE – Information Minister Lai Mohammed speaks during his visit to the school in Dapchi in the northeastern state of Yobe, where dozens of school girls went missing after an attack on the village by Boko Haram, Nigeria, Feb. 22, 2018. 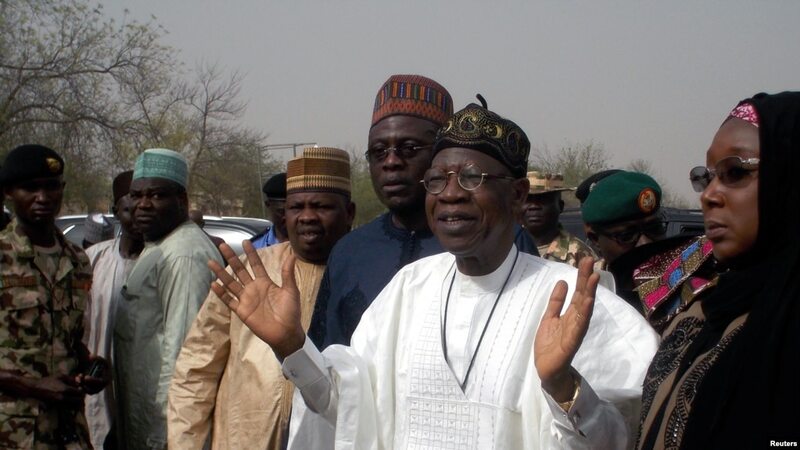 ABUJA (Reuters) — Nigeria’s government is in talks with Islamist militant group Boko Haram about a possible cease-fire and the talks have been going on for some time, Information Minister Lai Mohammed said on Sunday. It is the first time in years the government has said it was talking to Boko Haram about a cease-fire. President Muhammadu Buhari’s government has previously said it was willing to hold talks with the group but has given no details. Boko Haram has waged an insurgency in northeast Nigeria and neighboring countries since 2009 and aims to create an Islamic state. Tens of thousands of people have been killed, more than 2 million displaced and thousands abducted. Mohammed made his statement in an email to Reuters outlining the background to the release of more than 100 schoolgirls freed last week by the group after being kidnapped on Feb. 19 from the northeastern town of Dapchi. Boko Haram fighters stunned Dapchi’s residents on Wednesday when they drove into the town and released the girls, who said five of their group died in captivity and one had not been freed. Mohammed said 111 girls were taken from the school — one more than previously thought — and six remained unaccounted for.